Engrade has a good way of setting up different grading systems and scales. It also has an excellent UI and a great design. It does have an interesting rubric system that can be implemented within your grading scheme. Messaging students platform could be improved. I use google classroom to hand in assignments for the reason that Engrade is not useful for this task. One of the bigger problems is that individual assignments, rather than specific learning areas are being graded; although there are many work arounds to figure out a solution that works best for your classroom. Engrade does not have a comprehensive way to hand assignments in. However, it is a great evaluation program that keeps you in touch with parents. Although it's messaging program is limited, it does get the job done. I would suggest that the Engrade team imitate a feed like that provided by google classroom. In addition, the system of handing in assignments is unusable, and most teachers use other websites to do this. Maybe integrate it with Dropbox or google docs as a way of easily storing and organizing assignments. If google classroom had an actual grading system like engrade, as well as a smoother transition to any type of teacher website, that would be the perfect platform. Unfortunately, the best solution as of now is to use multiple different platforms. Engarde provides constant communication with parents. It also lets me change the grading schemes based on each course. I like that Engrade allows me to enter the grades directly into the report card for students. Engrade also allows teachers to enter assignment, tests and quiz scores into a grade book. You have the option to use weighted grades. I also like that you can only enter the grades for that trimester. All teachers that the student has can access the report card. They can also leave comments. As a Prep teacher (I teach computers) I need permission from the regular classroom teacher in order to enter the grades for my students. Until the classroom teacher gives me permission to enter grades for their class--I cannot enter the grades. I dislike the comments box because it is not large enough and sometimes comments do not fit. 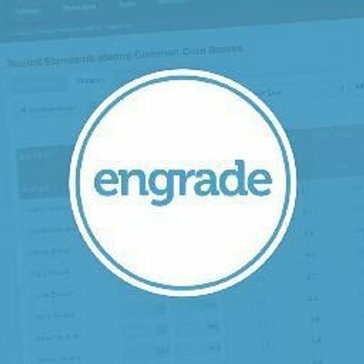 Engrade is easily accessible and saves grades automatically into the report card (whether you do it manually into the report card or use the gradebook). At our school district, we use EngradePro. You can also give a weight to different parts of the grade. I wish that the comment box would expand as you type. As a teacher, it really helps that I can digitally enter grades for my students. The grades are saved automatically and are easily accessible from any computer with internet. It also keeps everything aligned within the school district. All elementary schools in Fremont Unified use Engrade for their report cards. Previous grades can also be seen from other trimesters. I like how it keeps track of my students progress and makes it easy to grade and provide feedback through the rubric feature. Students can also track their progress and keep up with their assignment due dates through the program. The quiz creation feature needs serious help. When using a visual matching test or other tests that use imagery, it is hard to control how the images layout with the test. It makes the test confusing for the students and a lot of times I'm having to explain the test to them. The discussion forums could use a notification tool like the email so that the responses can be more timely. It would also be nice if the discussion forum could also integrate the rubric grading feature in with it in order to keep track required responses in one place. It's a great program, the phone app does not seem to be of any use. Gradebooks are universal and seen by many people at once to keep everyone informed of how the students are progressing throughout a grading period. "Helpful and comprehensive for both teachers and parents"
I loved being able to grade on my Ipad. This was awesome in that during school trips, students could upload their documents and made it easy for me to grade on the bus! I also like that parents can track and see the success of their students. I wish there was a component for checking plagiarism and citation support for students. Ensure that you have a good plagiarism checker for your school to go with the engrade work. ensure that your school is equipped to handle the platform and that parents also have access to it- if they do not, its not as helpful as it could be. perhaps provide parents with training days as to how to use the software. Transparency for students and teachers and parents in the grading process. Parents seem to support teachers more in that they know where their grades are coming from and can see feedback for students. EnGrade seems to have many things in one place, so a move to it could be a move to streamline from other platforms. Streamlining is always a good idea, if done right. The downside to streamlining is upheaval. People in general resist change. If three softwares are getting the job done, why change to one that seems hard? Give it time. I think that perhaps over the course of a few years this will find its benefit level. Patience, not always easy, is recommended. Standardized tests are so far the only thing that has really been done successfully, but we are still in development. if you want just simple grading system for teachers, student and parents this is ok. but as an administrator i will say no to engradepro, all data or function are limited and when you ask why? the answer i get is not in their list to be worked on for now. for example Grading period (semesters or quarters) you can't lock the editing period the only thing you can do is Hide and if you do so no one can see it even you as the admin. and every time you want to check or view you have to unhide it which will unhide for every one too. to top it off if a teacher accidentally enter a assignment and entered a date of a past semester or Quarter and save it. the grade in that pasted semester will change. so as a admin i am not happy and considering to move if engradepro do not improve soon. "Needs improvement but does the job"
Use the technical support phone number as often as needed. Push to get the answers you need. Sometimes I was told, "Well, it's not an 'issue' with the website; it's just not very user friendly." I don't want to be stuck in a semantics argument; I just want the issue fixed. We wanted to achieve quick record keeping that was web based, easily accessible to teachers and user friendly. I think it is really user friendly from teachers, but the administrators must be very diligent. The have a phone number for tech support, which I have used a number of times. The benefits are automatic grade calculations (weighted and not weighted) as well as administrative access to all grades and classes. "Engrade to end- grade hassles." The user interface and accessibility of the program is easy and user friendly. Grades can be entered into the system with ease, assignments can be added easily and percentages (A, B, C, and D) grades are colored coded for easy identification. Teachers can communicate with faculty and students in a user friendly communication feature, keeping everyone connected. I have to be added to each class by my supervisor, I cannot add the class myself which can take time if my supervisor is out of the office or busy. Grades are inputted easier and quicker by various staff members as opposed to 1 staff member responsible for every class which improves grade turn around and up to date tracking of student progress. "Proven to be great for organization and keeping track of my students "
I guess that the thing is like the most obout Engrade is how versatile the software is. That is, I can customize my data by marking periods and keep records of my students online. This eliminates my need to use unnecessary paper for grade scores and as such, my students and their parents always have access to grades, etc. There’s not much Wrong with engrade but something the software does mess up and will not allow me to select the second marking period. In other instances, students have reported not seeing any updates on their end for a short time. Engrade has been completely integrated in my day to day work. It plays sich a large role in keeping my classes structured and organized. It’s been so convenient to just input all my the data online and it’s stored permanently on there. I liked Engrade for the ease of use. It had many factors that were beneficial to our teachers. Make sure that Engrade provides you with everything you need for your educational purposes. Originally, Engrade was free so we were able to take the benefits of what it offered. Later it became a paid service. At that time, we chose to go with a different company because we were not able to get the additional services but we were still paying. "Great Idea but Engrade Pro falls VERY short"
I like the way it looks. It's a nice, sharp looking program. I like the "copy to all" feature when grading in one particular page of the grading system. I like that parents and students have access to the student's grades at any time and can keep abreast of their kids work. I like the copy feature so I don't have to input the same information for each class when creating assignments which apply to more than one class period, or tests for that matter. It looks better than Easy Grade Pro but it FALLS WAY SHORT of being easy or smooth. After working with this program since January of 2016 (it is now May) I have a litany of problems with the program, many of which I've asked for and haven't received help for and which continue to be problems and bugs in their system. #1) When student's or parents contact me it send me a link to go log on to the program to read their message. It would be WAY more convenient to read them in my email so i can read if it's something I need to address immediately or can get to later. I mentioned that to an employee who came to our class and was told that they had bigger bugs to work out first. What's more important than communication with parents? #2) When I correct the test and click "save to gradebook" it automatically saves it with the date that I input them NOT the date it was administered AND it saves it as an "assignment" not a test. I was not aware of that for the first couple months and when I went back and corrected it, my students grades were changed dramatically due to the different weight of tests and assignments. #3) I dislike that I've spent 15 minutes of my life writing this review. There are so many little things that take extra time. VERY impractical for a teacher when we have 150-200 people to keep track of to deal with a bunch of little things. I will, if given the opportunity, suggest a different, more complete and ready program. It seems like they didn't bake their cookies all the way and now they're falling apart. Too bad. Not applicable. This question is an example of how engrade pro admin doesn't even know what teachers and end users are all about. "Ideal Assessment Platform for School Buildings"
Ease of use, clarity of interface and student/parent satisfaction with the platform. Now it's a paid service! Not helpful for title I schools in high poverty districts. get everyone in your school on board so it can be adopted by the entire learning community. I'm a past user of Engrade; loved it. Such an easy, intuitive platform and efficient to set up. Once it became a paid service, I had to resort to a different assessment platform because it was not adopted (paid for) by my school. This grading tool is excellent. The interface is straightforward and simple and my students love seeing their grades in real time. It makes grading a snap for me. I really like the option that allows you to give more weight to certain assignments (e.g., a final exam). I'm very happy with Engrade and look forward to using it next year. I have two qualms with Engrade. The first is with the Standards option. At our school we grade by outcomes, and the Standards option allows us to tag assignments according to our outcomes. However, If an assignment has two outcomes, that assignment (and grade) must be logged twice in the gradebook. It would be great to be able to tag one assignment with multiple standards. The second is with yearlong courses. At the moment, I have to create a new class every semester in order to have a grade at the end of the semester from which I can average a year grade. It would be very helpful if there were an option to create a yearlong class with semester subcategories. Then students could see their semester grade as well as their year grade. It would also save the trouble of having to create new classes and fish out the students names for the roster every semester. This is not applicable to my position. "Effective for what it sets out to do." Simple interface. Easy to upload grades and modify them to my own grading system. It was also easy to set up, both within my department as well as in the classrooms. User interface. Also, multiple users for the same students when different instructors add the same students. Students tend to forget their password and username frequently. I wish there was an easier way to retrieve this information. In addition, the standards function is not set up very well. I wish there was a way to tag an assignment to more than one standards. The attendance tool is also a bit basic. I would like a better way to make absences and lateness and send that to parents. What are your goals? What other LMS are other users using? Have been using? Considering? How much admin support do you require? A unified and cohesive grading system in our department. And it was free. I like that it is easy to enter grades for the entire class or for just one student. I also like that I can pull up the students grades for review at any time. I don't like that some of the reports are only available from the report page - I would like to be able to get to everything from the students profile. The program is a great addition to any school. Time - I am solving the time it takes to enter from a gradebook to a computer to run a report card. It's very user friendly and easy to use. It's the best program I have used so far. It was easy to creat assignments, post grades, copy and paste the assignments to another class, and enter grades in a timely manner. To be honest, there wasn't much that I disliked. I remember that the toughest part was making it accessible to parents. I think Engrade needs to market to more schools. I feel like it would be more popular if others knew about it. "I've used it on a computer and through the app; "
It's VERY user friendly. Very easy to navigate around and a lot of the features that can be done on a computer is accessible through the app as well, which isn't in a lot of apps so I love that. I'm not sure if it was the phone I had, or my connection, but staring up the engrade app took a while. Grading is made easier with engrade. Informing students about assignments and announcements has never been easier. I like the fact that you can customize the grading system, and that you can archive classes that you don't teach anymore. If you don't pay attention, you risk deleting grades that you had input formerly, and there is no way to retrieve them. I don't need a grade book anymore, and my students can access their grades in an easy way. It is a very transparent method. * We monitor all Engrade reviews to prevent fraudulent reviews and keep review quality high. We do not post reviews by company employees or direct competitors. Validated reviews require the user to submit a screenshot of the product containing their user ID, in order to verify a user is an actual user of the product. Hi there! Are you looking to implement a solution like Engrade?